Letting Others Use Your Ride? Think Again. 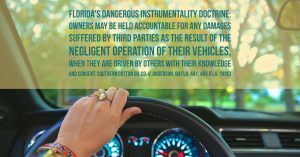 Florida’s Dangerous Instrumentality Doctrine states that the owner of an inherently dangerous instrument, which includes tools and vehicles, is liable for injuries caused by its operation. Think twice about who you are letting get behind the wheel of your vehicle. Know the law. Enjoy the weekend. https://www.beregovichlaw.com/wp-content/uploads/2017/01/blf-logo-gold.png 0 0 Beregovich Law Firm https://www.beregovichlaw.com/wp-content/uploads/2017/01/blf-logo-gold.png Beregovich Law Firm2017-03-31 16:10:402017-03-31 16:15:02Letting Others Use Your Ride? Think Again. We Work Around the Clock for our Clients I Was Injured in a Car Accident. Should I Hire a Car Accident Attorney?